← 40 Years Old – Again! The date, 31st March 1973. The Dark Side Of The Moon entered the UK Official Charts at #2 spot on the 31st March 1973 in the 13th (and unlucky) published chart of 1973. It was in fact the highest position it would make in the UK, and slipped down to 5th the next week. 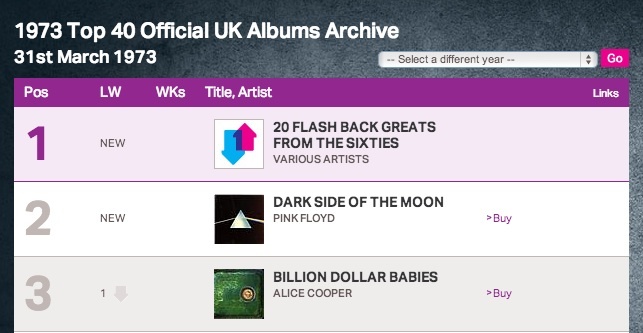 Remarkably in its 40 years of incredible success Dark Side has never been #1 in the UK. 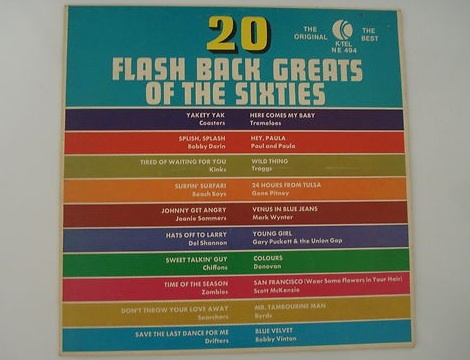 The week after (in the 14th UK chart of 1973) another compilation ’40 Fantastic Hits From The 50s And 60s’, this time from Arcade Records (a Dutch record label specialising in compilations), entered at #2 behind K-tel’s “number one” album, pushing Dark Side further down. The music market was “expanding at a phenomenal rate”, Roger’s own words (1973), and compilations did very well, evidently. 1980s compilations in the UK would go on to be dominated by the (infamous) ‘Now That’s What I Call Music’ series. This entry was posted in 40 Years Ago Today..., DS UK #2, Stats. Bookmark the permalink. It’s so much fun, and sometimes torture, to recall these commercials. Todays it seems to be all “Time Life” I lived the era from Disco to the last time I bought Ktel was Soft rock Classics on CD. The CD’s were indeed a bargain, but nowadays everyone just plays MP#’s downloaded to itunes and other media sources. if itunes had any brains they might even feature to download all the great Ktel and Ronco Collections. I still have a couple/few of them, Dumb Ditties, Wacky Westerns (Which I uploaded images to the Ktel Museum. Yes on Vinyl, and none of them skip and play fine.